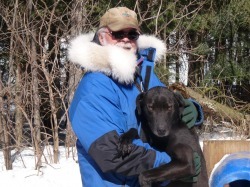 "A Look To The Past, Present And Future Of The Sled Dog Here in The Northern Forest!" The Blog will be taking a little different approach over the next several weeks to give a deeper insight into the back ground/development of the Current Performance Canine Athlete. WHY ARE PERFORMANCE RACING SLED DOGS SO EXPENSIVE? ​Many people getting into racing sled dogs wonder why they can cost so much. On the Semi Pro and Professional Sprint Racing Circuit, performance sled dog can range $1000.00 up to $20,000.00. I can understand that some people question why anybody would spend that kind of money on Non-Registered Breed of dog, in other words a Mutt! However, if you were to check the documented pedigrees of these dogs, you find them as complete or more complete than the Registered Pure Breeds. Before I go any further, I must decree that views responded here are my own and are not to be considered anything other than that. The racing Performance Sled Dogs of today are the product of many years of selective breeding’s. One of the major differences between Purebreds and these dogs is a result of the reasons for the breeding’s. The racing sled dogs we are talking about were bred for performance only and not for a particular look, colour etc. The advancement from the earliest working sled dogs to these performance athletes of today was constant evolution to produce dogs that were faster, more durable and more capable of handling the needs to perform in the desired race categories whether it be Sprint or Long Distance Events. Some of the earliest innovators in the development of the modern day racing dogs goes back to Attla, Wright, Redington, Saunderson, Butcher, Buser, Streeper and Ellis to name a few. The above mentioned Mushers/Breeders were all instrumental in the development of the designer racing dogs currently seen on the racing circuits. It is interesting many of today’s canine athletes can be traced back to some of the Original Attla Dogs. The Performance Racing Sled Dogs of today are anything but a Mutt. No, they are not recognized as a Registered Breed nor will they ever be. These canine athletes of today are constantly evolving in their strive to achieve top performance. Over the next several weeks, we will get more into the breeding, puppies, socialization, conditioning/training, nutrition and the insight to develop top performers.